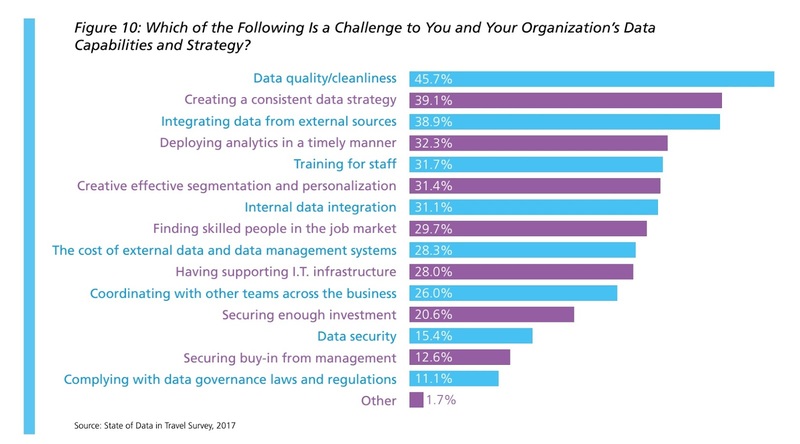 EyeforTravel’s new State of Data and Analytics in Travel Report 2017 has identified data quality and cleanliness as the biggest challenge facing the more than 450 travel data professionals surveyed for the report. The next biggest challenge, noted by four out of ten respondents, is creating a consistent data strategy. Travel brands need to make sure that they are co-ordinating properly and communicating data strategies across their organisations. This was reinforced when respondents were asked whether they have a clear understanding of the Key Performance Indicators (KPIs) they should be measuring and working towards. Here, a surprisingly high percentage - 27.1% - said “no”. Other major issues reported by the industry are data integration, deploying analytics in a timely manner and skills and training. For the former, 38.9% said that integrating from external sources is a challenge and 31.1% said that internal sources are an issue. For the latter, 31.7% of the panel felt that getting adequate training was a concern and 29.7% identified finding skilled people in the jobs market. Click here to download the full report for free now. Or to learn the best data and revenue management strategies directly, why not attend EyeforTravel Europe on May 3-4? Attribution continues to be an issue for the travel and tourism industry as travellers hop across devices and sites during their journey according to EyeforTravel’s State of Data and Analytics in TravelReport 2017. Of the marketing professionals surveyed, 54.3% reporting that they could either track users to a limited degree (24.5%), just on their own domains (16%) or not at all (13.8%). For those companies that report that they can track users in some detail, a quarter say they can track them across most devices and touchpoints. A further 20.7% report that they can track users across touchpoints but not across devices, illustrating that it is the cross-device behaviours prevalent in travel that are the main challenge. The survey also found that out of the more than 450 travel data professionals surveyed, just 30.9% are gathering geo-spatial and geographic data and 30.6% are looking at mobile app data to get insight into customers. This further supports the need for the industry to expand its efforts into multi-channel data gathering. Investment into systems and skills to do this should be forthcoming, as the report notes that three quarters believe that their department will receive budget increases in 2017 against 4% who expect a decrease. 62% of travel marketers rate Facebook as the most effective social media network. Facebook is peerless amongst travel marketers according to a new industry-wide survey from EyeforTravel. The State of Data and Analytics inTravel Report 2017 found that 61.6% think Facebook is the best performing social media network, leaving Instagram – also a Facebook company – a distant second at 15.8% of respondents. Twitter rounds out the top three at 10.3% of respondents and is followed by YouTube at 6.2% of respondents. No other social media network had a significant response rate. The survey also found that 78% of travel marketers are using social media data in their marketing campaigns. This level of integration illustrates the importance social now plays in marketing efforts, a position that is likely to increase rather than diminish in the medium-term. For those looking forward to more cash to play with this year, budgets are often increasing by a substantial amount. More than half of the entire sample reports that they expect budgets to increase by 6% or more and 30% expect it to increase by 11% or more. However, part of this may be because travel companies data efforts are coming from, in general, a relatively small base. Although 65% of the panel reports that they have a dedicated data, analysis or insight team, they are largely staffed by small teams. Two thirds of respondents report that their team is less than 10 employees strong and 51.5% have a team of five individuals or less. The survey also found variation between the expectations of data professionals for this year when it comes to where they are based. Respondents were most optimistic about budget increases in Asia-Pacific, followed by Europe and then finally North America. This geographic divide was reinforced in how respondents view the coming year for the travel and tourism industry as a whole. In both Asia-Pacific and Europe 16.3% of respondents are neutral or negative about growth prospects for this year, compared to 23.3% of respondents from North America. There is a divergence in the way consumers look for and book travel between the rising economies of the East and the developed countries of the West. This is all being driven by mobile, as consumers outside the West have never associated the desktop or laptop as being their primary device to connect to the internet or conduct digital travel purchases. EyeforTravel, in conjunction with Jumpshot found that India was the leading country for mobile visits to travel sites among the five countries that were studied. There, two thirds of users visiting travel sites were doing so from mobile devices. EyeforTravel has also been studying Chinese consumers and found a very similar pattern amongst Chinese consumers, with 67% reporting that they principally use mobile devices to plan their trips and 50% use them to book accommodation. You can download the white paper here and keep an eye out for our upcoming Chinese Travel Consumer Report on our report page. For more insights like these, why not sign up to our newsletter? Or you can get the best opinions first hand by attending one of our events. India overtook China last year to become the fastest growing major economy in the world and is set to continue this in 2017 according to forecasts. However, the GDP percentage growth pales in comparison to the exploding growth in domestic travel. IATA reported that in 2016 India was the leading market for domestic air travel growth, with Revenue Passenger Kilometers (RPKs) soaring by 23.3% according to IATA. In more good news, 2017 is expected to continue the trend in Indian domestic travel. Journey numbers, occupancy and Revenue Per Available Room (RevPAR) are all expected to grow in the country across the year, particularly for the latter, as hotel room construction has slowed recently according to Knight Frank. It is also important to remember that the market is coming from a very low base. IATA’s figures note that India’s domestic air travel market had a market share of just 1.3%, compared to 8.7% for China. This means that even if the global economy performs badly, India’s travel growth should remain one of, if not the, world’s strongest in percentage terms.